Alfred Russell Wallace (1823-1913) was a British naturalist who independently arrived at the theory of natural selection when he was recovering from malaria on a remote Indonesian island. He wrote a paper describing his idea and famously sent it to Charles Darwin for his views. 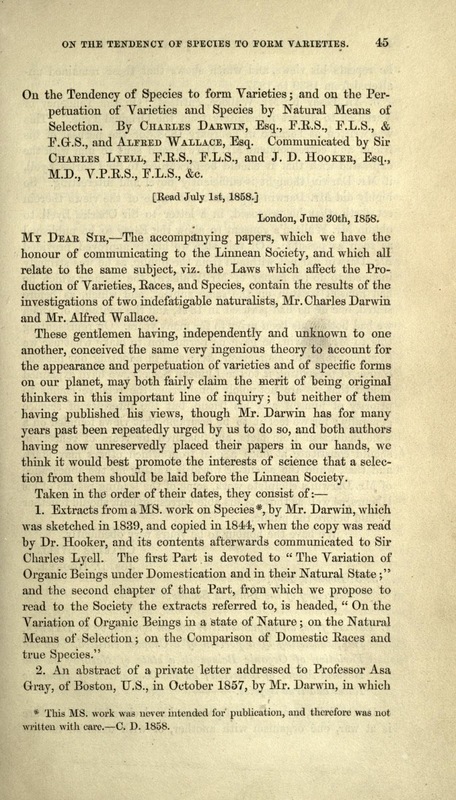 By rights Darwin should have sent the paper on to a suitable journal with a recommendation that it be published, thereby giving Wallace scientific priority for a radically new, and essentially correct, way of understanding nature. But that isn't what happened. 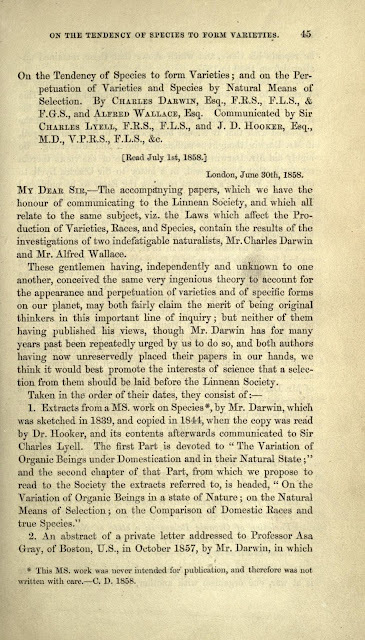 Darwin talked it over with a few influential chums and they cooked up a way of presenting Wallace's paper and a hastily written paper by Darwin at the same meeting of the Linnean Society in London in July 1858. The Natural History museum will begin a celebration of 100 years since Wallace's death this week (more HERE). An archive of his letters has just been put online HERE. Wallace was a great Victorian travel writer and perhaps his best known volume is The Malay Archipelago. The Internet Archive has a full copy online of the 1869 edition of The Malay Archipelago: the land of the orang-utan, and the bird of paradise (HERE). Recently the Guardian reviewed this classic (HERE). 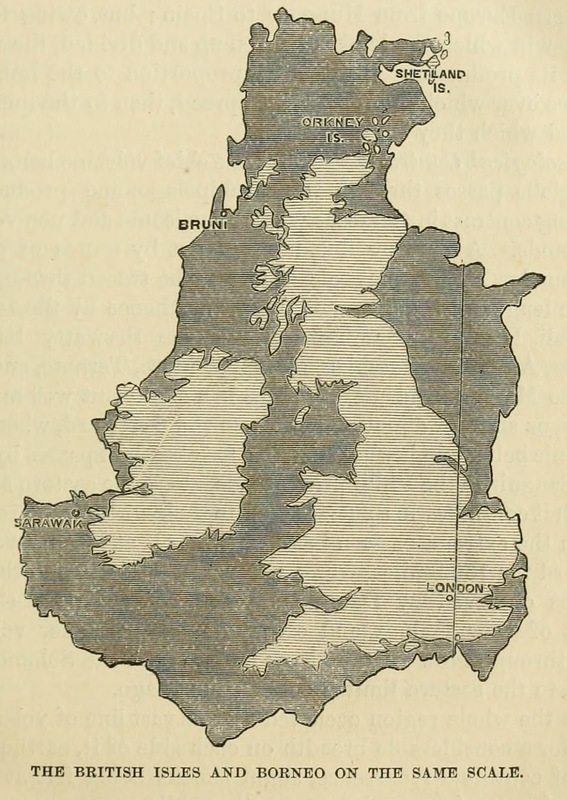 Below is a map from the book showing the island of Borneo (now split between three countries Brunei, Indonesia and Malaysia) on the same scales as the British Isles (now split between two countries Eire and the UK). Wikipedia lists the area of Borneo as 743,330 km2 and the British Isles as 315,134 km2. 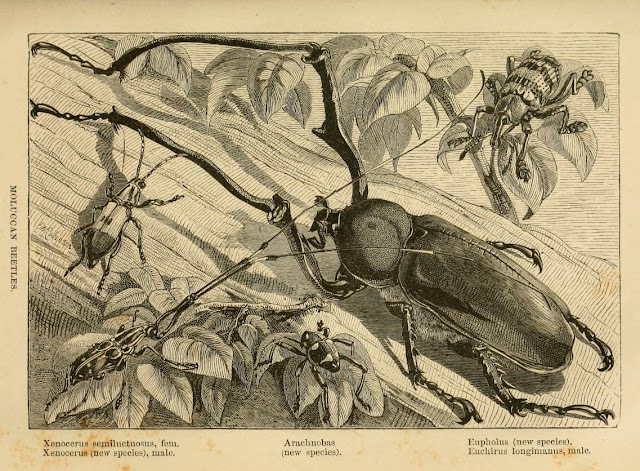 The book is well illustrated - an example here is a full page illustration of three new species of beetle from the Moluccan islands.